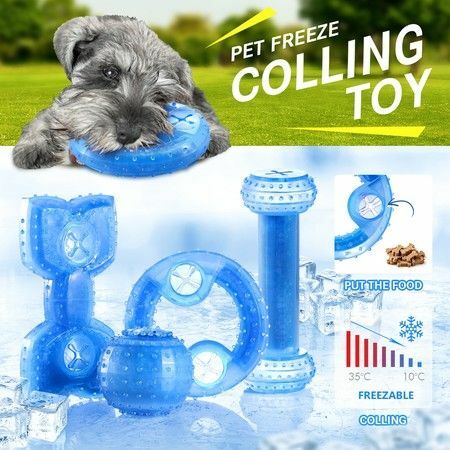 Freeze the teething toys in the refrigerator to treat your dog, cat or other pets in hot summer. Furnished nubs and grooves texture with different shapes, the pet products will be the perfect playing toys and chewing toys for your puppies and kitties. These frozen toys allow for loading dog food to draw their attention and satisfy their desire for treats. The eco-friendly rubber material filled with purified water is non-toxic and safe enough for dogs. For your peace of mind, the interactive dog toys are durable for cat or dog to bite in the long run. Bring these pet toys home now and create endless fun for you and your loved dogs. Keep your dog cool, as well as freezable for long lasting refreshment. Filled with 100% purified water. Suitable for dogs cats and any other pets. Put in the snacks that the dog likes, which can improve its interests and hold your dog's favorite treats. Massage its gums that prevents plaque and tartar buildup. Release the dog's sense of separation anxiety. Relieve boredom and depression.